Please someone rate my store im getting around 1k traffic but no sales!!! I recently launched my store https://thisremarkable.com/ and I’ve recently finished it as well. Of course there are so many ideas of how can I develop it in future and implement new products etc. but of course, first I need to make it to generate some sales before I make it bigger. So of course I’ve ran into a problem where I am getting a lot of traffic but 0 sales. In the past 3 days I’ve had nearly 1400 visitors, around 1372 to be exact. My targeting is off and I am targeting people who like all my products but are not willing to buy them. I feel like I am so close to break through and I just can’t put the last pieces of puzzle together. It would mean so much to me if you guys could hop on my store and check it out, if something seems bad, please tell me. In total in these 3 days I’ve had 1400 visitors and only 2 orders. I was launching various type of ads. Starting with PPE to get some social proof on my ads and posts. Cost per Engagement was as low as 0.001$ which was really nice and I thought I am on the right track, but I didn’t had many visitors though. Then I switched to traffic ads with the same ads I had all the likes, shares and comments, where in the first day of launching traffic ads I got my first 2 sales(in the morning and then nothing for the rest of the day. I think I was just lucky getting that sale) and a LOT views on my site. For all the the add to carts I launched WC optimized for “Add to Carts” while still running all the traffic ads. All ads had daily budget of $3, since I was testing a lot. They were all set to Worldwide, not a specific country. I made one campaign for the US but the results I was getting were horrible and it was a lot more expensive. As well as I read targeting specific countries is good only for scaling. (Might not be true but nonetheless something is not right). While working on this store been very active on Instagram as well posting a lot of content there then reposting it to Facebook if someone is wondering if I am even doing all the social media work. I really hope there is something wrong with my store why it is not converting, because with facebook ads I’ve tried so much and nothing has worked. Even though I have tested campaigns for only a day max because they all get so many views that it is clear that from 1000 visitors there should be more sales than they are right now. Your post was armed with detail data and great ideas. Your insight has proven that you are very analytical, which is excellent to have as an online business entrepreneur. Continuing tweaking your ads and building your knowledge on how to interpret your traffic will help you break through the current situation. Let's tackle and break them down one by one. We'll be able to try and figure out why such impressive traffic isn't converting to sales. The first idea/option you brought up in the beginning - something's happening at your store (not enough trust built or something related to your store). It's a great observation. In order to see if your hunch is right, I recommend you try out the three apps: Lucky Orange, Hitsteps Analytics, and Hotjar. These are great apps that can let you see heatmaps and videos of what your visitors do on the site. The results will offer you some great insights into where the customers are dropping off, and why they don't convert. Feel free to use each app by its free-trial period and remember to remove it before the trial period ends to avoid charges. The second idea/option you brought up - the ad's target is off. Another great assumption. How we can see if this is true is through your Shopify analytics. If you haven't done so, I suggest you take some time check out the dashboards. 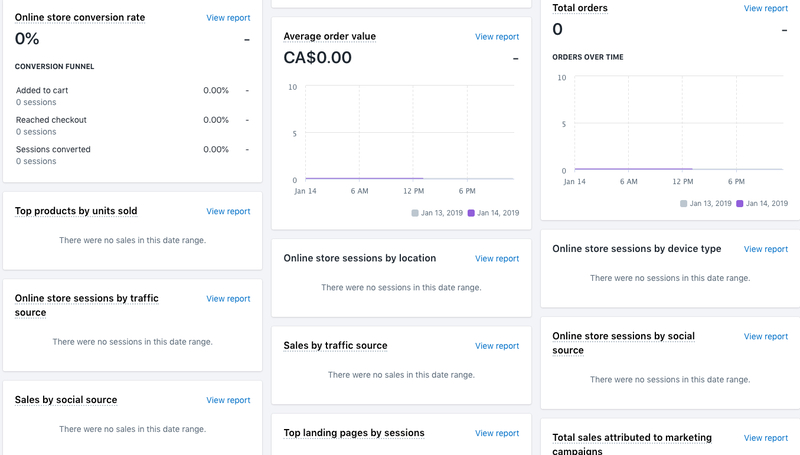 Located on your Shopify admin, Shopify Analytics's dashboard offers you an overview of what's happening in your store. The sections in this screenshot allow you to understand a little more on the traffic coming to your store and which products are top-selling. Starting from the top left corner, with the Online store conversion rate, the goal is to hit around 2%. If you can go beyond 2%, that means your store is performing well. Moving downwards, the Top products sold by units will let you know which products are your top performers. Since each ad is most likely featuring one product at a time, here is a great spot to figure out which product is selling. If there are 5 equally strong selling results, then you know your ads are performing equally well. If there is a big difference in numbers, then you know which ad isn't performing as well as you think. This goes back to the idea of CTR. Even though the ad has a high rate of CTR, it doesn't necessarily equate sales. The idea here is to keep the top performing products and switch out the lower performing ones. Switching out doesn't mean removing the product altogether. Rather, you would switch the ad to a different product and test it again. The Online store sessions by location is a great place to check out where your clicks are coming from. If the top countries showing up aren't the US, it's worthwhile to analyze your price points and if they would work with the countries. For example, if the high clicks were countries from Southern Eastern Asia, then your idea/option would be right. The ad's target love your product but your price range may be too high for them. The Top landing pages by sessions offer valuable information on where the visitors came to visit in the first place. This is also a place for you, again, evaluate how well your ads are doing. If the 5 product pages are pulling traffic equally, then you can definitely keep the ads running. If one is outperforming all others, then it's time for you to tweak your 4 ads and switching out different products for you to promote. Similar to rest of the sections, the Online store sessions by social source will let you know where your traffic is coming from. All the sections share some insights on how your store is running with the ads you have actively running. A key to keep in mind here is that clicks don't always equal to the conversion rate or sales. That being said, since you've reached over 1000 visitors per month, I suggest you look into an app called Kit. It's an app that helps you target look-like audience and automates the Facebook ads for you. Don't forget to check out our free webinar on how you can get start with Kit. For Instagram, I recommend you to take a look of a tutorial on how to grow your business with Instagram. Ok so first off good job in getting a store actually set up. That’s a great step in the right direction... however I would stop spending money on ads until you get your site dialed in. You have some serious issues that need fixed before you get some real sales. Fix your colors. That ugly yellow for the buy it now button is hideous and almost impossible to see. Remove the buy it now and just stick with the traditional add to cart button. Amazon just uses add to cart for a reason. Make the add to cart button a brighter color. Black is never a good color for the add to cart. You want something that stands out. There are tons more things as well that should be fixed. Spend some time googling “optimize Shopify website” and other similar search terms and look at the example websites. You can even hire people on fiverr to give you some tips and tweaks that your site needs by searching optimize Shopify website on fiver. Spending a little money/time to optimize your site will definitely help you sell more. Why on earth do you have 2 naked girls on your front page? Thank you so much for your feedback and time. You definitely have some good points that I should be looking out for. The yellow color I thought was because It was going well together with products and overall color, but changing the add to cart and buy now button was a very good mention! This will not solve your problem. Your damn optimisation is for add to cart. You should be optimising for purchase for crying out loud. Why did you not do this? You optimised for add to cart so you will get loads of add to carts i.e 11 out of 100 people. That is whole point of that optimisation.